The rhubarb season has begun and the crown I planted 18 months ago is seriously bearing fruit! So we had it very simply roasted last night for pudding, served with some good quality ice cream. Simplicity at its best. 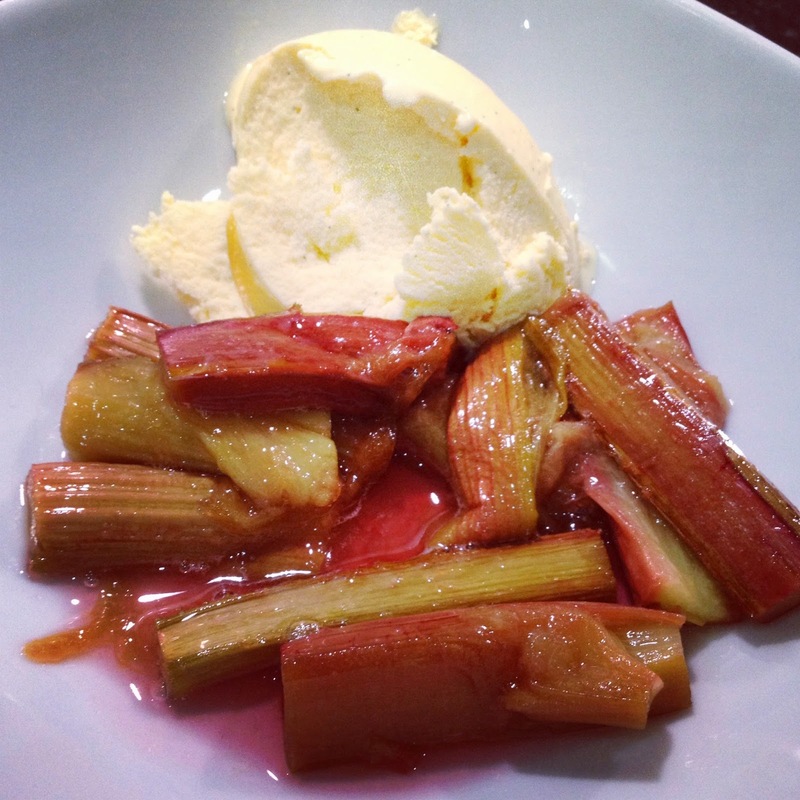 Place the rhubarb, sugar and water in a roasting dish and cook in a hot oven for 20 mins until the rhubarb is soft and starting to caramelise and there is a syrupy sauce forming from the sugary juices. Serve warm with ice cream. Yummy. This was made to go with the Roasted Veg soup we had earlier in the week. Using my food mixer I was able to get all the dough mixing done in 10 mins, so it was very low labour for a week day night. Olive oil , sea salt and moroccan spices for the top. Place the dough ingredients into a food mixer and using the dough hook mix slowly until it comes together. Knead for about 10 mins until the dough is light and springy. Cover with a cloth and leave to rise for about an hour in a warm place (use a bowl of warm water if you’re in a hurry, it cuts the proving time to about 45 mins). Once the dough has risen, turn out and place on an oiled baking sheet. Stretch to fit the sheet and then prod holes with your fingers into the top. 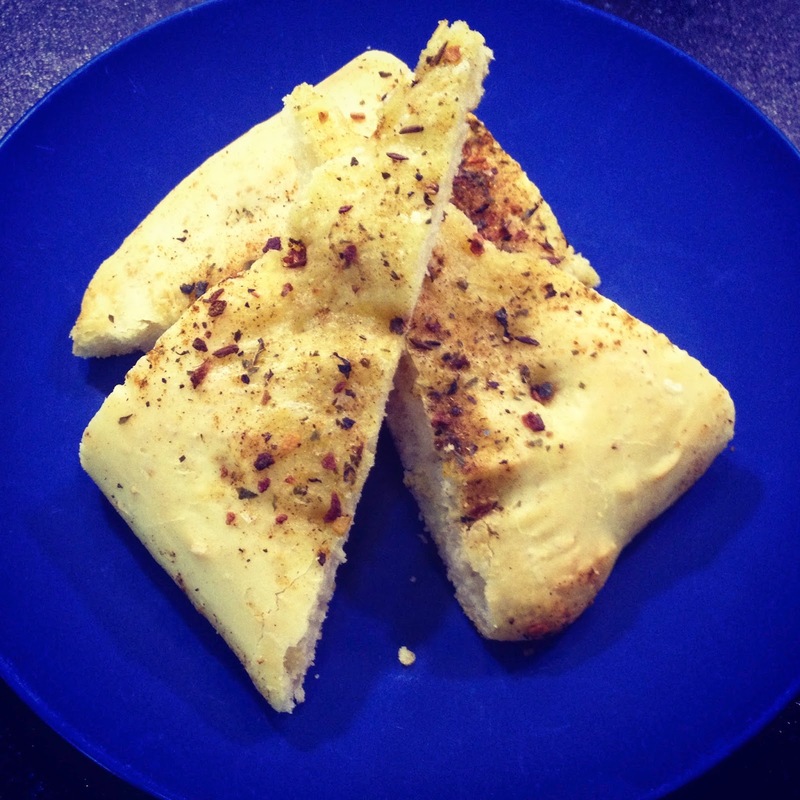 Drizzle with oil and sprinkle with spices. If you have time leave it for a further 20 mins to rise again but if you haven’t bake in a hot oven for 20-30 mins until risen and light and airy. I had a glut of veggies that needed to be used so roasted a whole big batch of them and turned half into this soup and the other half into a yummy lunch of roasted veggies, cous cous and spinach. 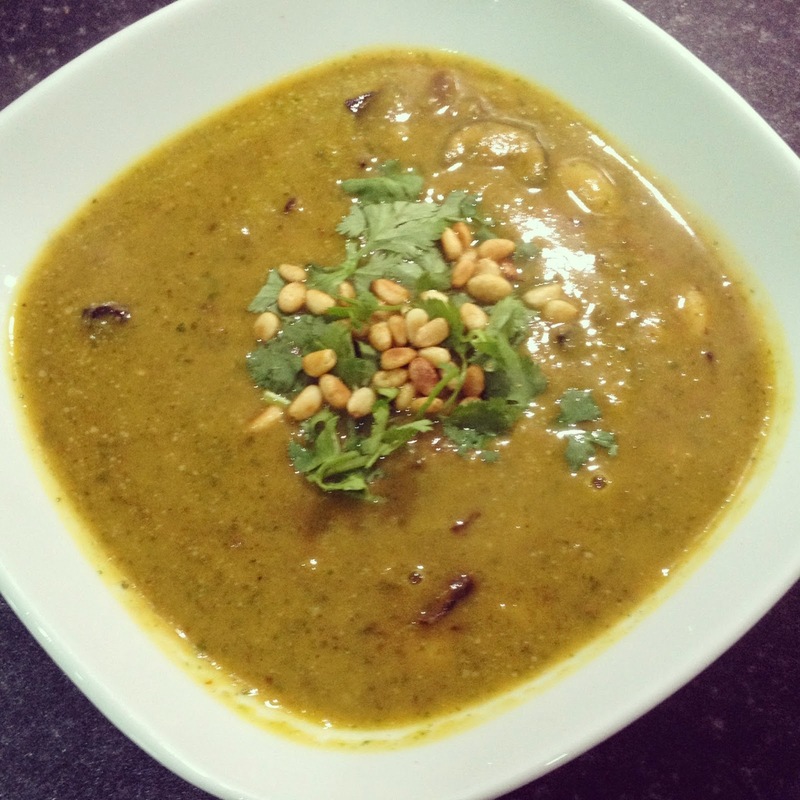 The soup is beyond easy to make but tastes like you’ve slaved over it for hours! Begin by chopping sweet potato, carrot, onion and parsnips into small chunks. Toss in the oil and spices and roast in a hot oven for 20-30 mins until tender and starting to catch a little. Prepare the beetroot and courgette in the same way and roast on a separate tin. Once the tray with the root veg has done, place the roasted veggies in a pan and cover with the stock. Bring to the boil and simmer for 2-3 mins. Add the spinach to the pan and blitz to a puree. Return to the pan and add the beans. Heat through. Serve in warmed bowls topped with a couple of spoonfuls of the roasted beetroot and courgette, pine nuts and coriander. Serve with copious bread. The God of dishes made from greens. This is a dish that sounds weird but tastes amazing. I don’t know what alchemy occurs but I like that it does. Pick the kale off the stalk. It should come off in bite sized pieces but if it doesn’t, tear it into such. Place in a bowl and drizzle over 1/2 tbsp olive oil and a pinch of salt. I am a purist here and insist you use proper maldon salt. Toss together and then spread onto a large baking sheet. You want it in a single layer or it won’t work properly. Place in a hot (200 degree) oven for 10-15 mins. You want some of the kale bright green and other bits turning brown and translucent. Decant into a serving bowl and HIDE at least half of it. Trust me. It tastes so good that you’ll want to eat more than you should in one sitting. This will lead to kale loathing, and other possible and less desirable side effects. 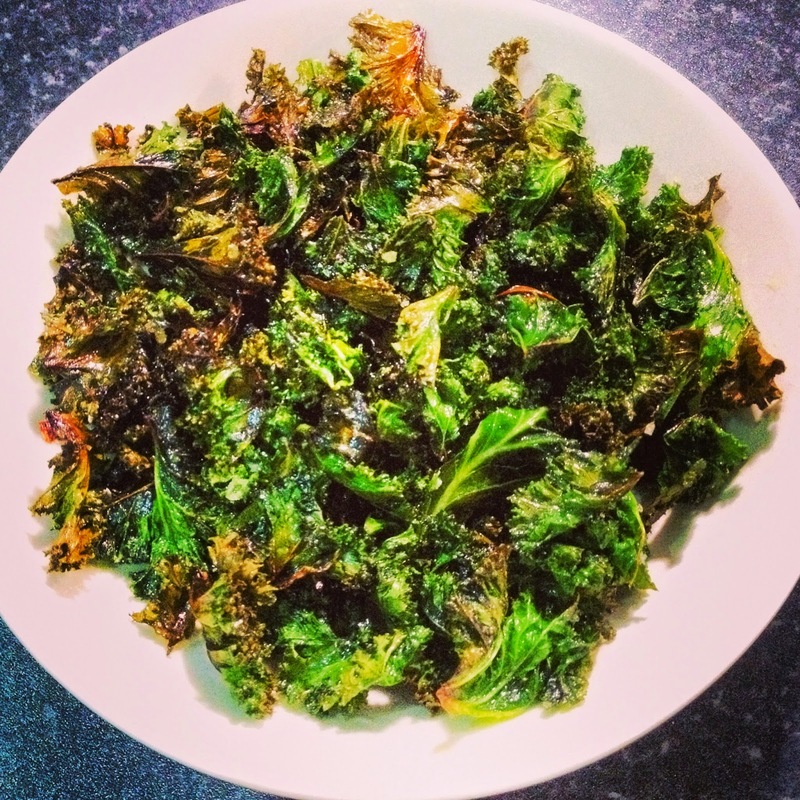 Delicious as a healthy snack, it’s also yummy with mashed potatoes and fried eggs. And chilli sauce. 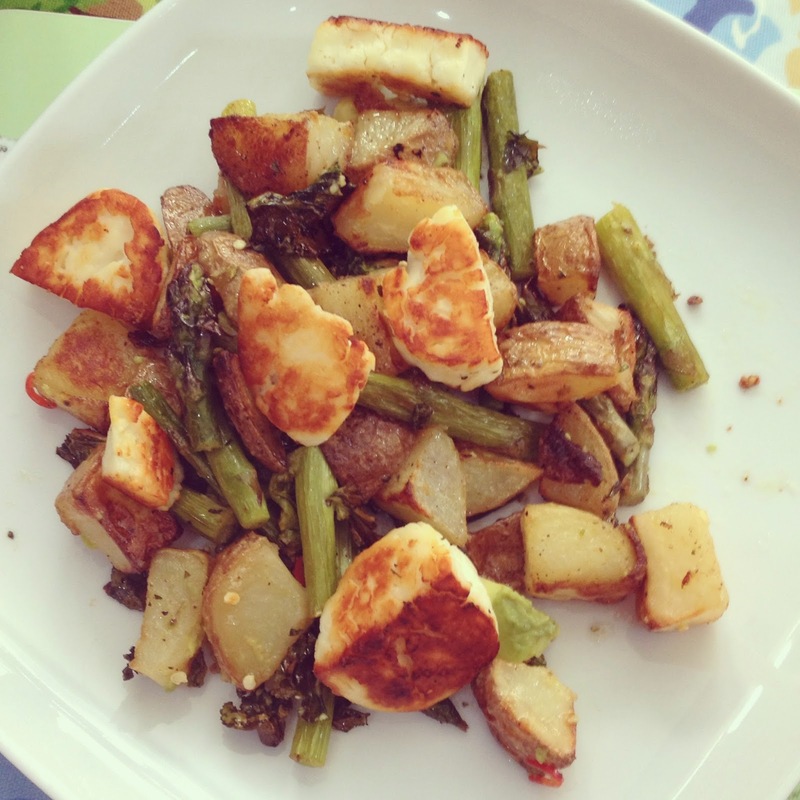 I’ve been meaning to blog this for ages as someone asked for the recipe (sorry!) but just hadn’t got round to it… Well better late then never eh 😉 You can make this dish as spicy or not as you wish. I like mine ferociously hot. Plain boiled jasmine rice, Raw peanuts, lightly pan roasted and fresh coriander to serve. Begin by making the salad. Using a food processor if you have one, grate everything and place in a bowl with the dressing ingredients. Mix thoroughly and leave to one side while you prepare everything else. Make the sauce by placing everything in a pan and bringing to a gentle simmer. Cook for 2-3 mins then leave to one side. Make the fritters by mixing everything together in a bowl. Heat about 1cm of oil in a large frying pan and fry spoonfuls of the mix for 3-4 mins on each side until lightly browned and cooked through. Drain on kitchen paper. 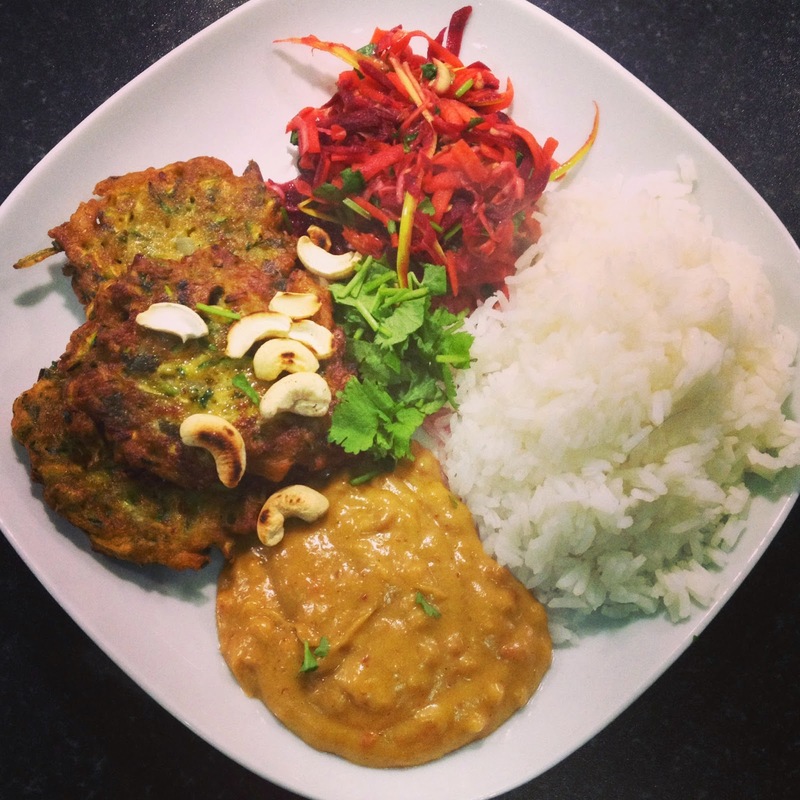 Serve garnished with peanuts and coriander and with plenty of plain rice to cool your mouth down on! 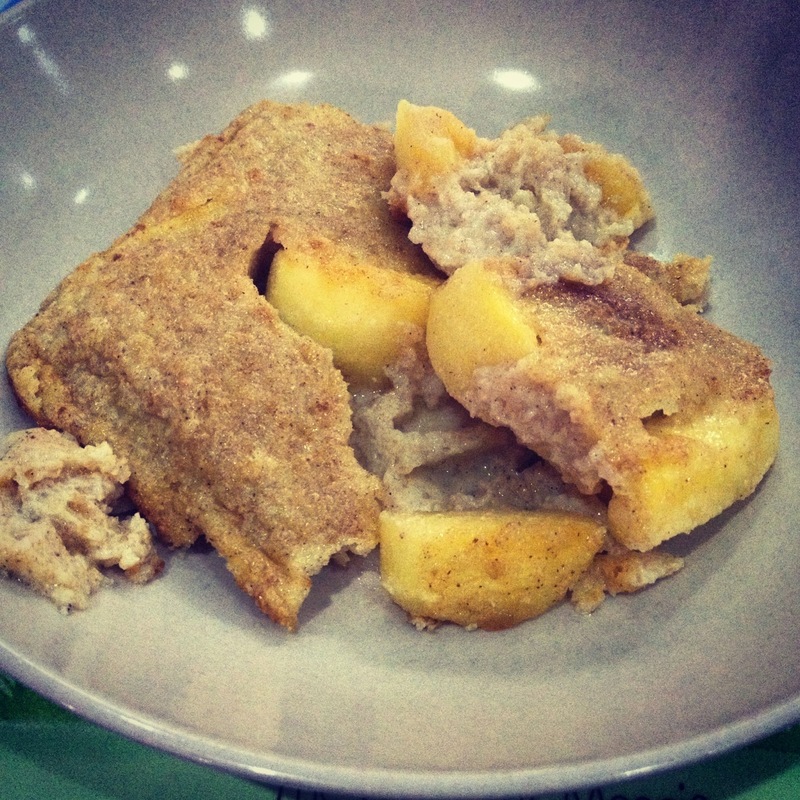 A brilliant way to use up stale bread and dodgy apples by turning them into a nourishing and comforting pudding. This is based on a recipe in River Cottage Everyday. Heat the milk to boiling point. Meanwhile mix the eggs, nutmeg, cinnamon and vanilla (1tsp of each) and 75g of the sugar in a bowl. 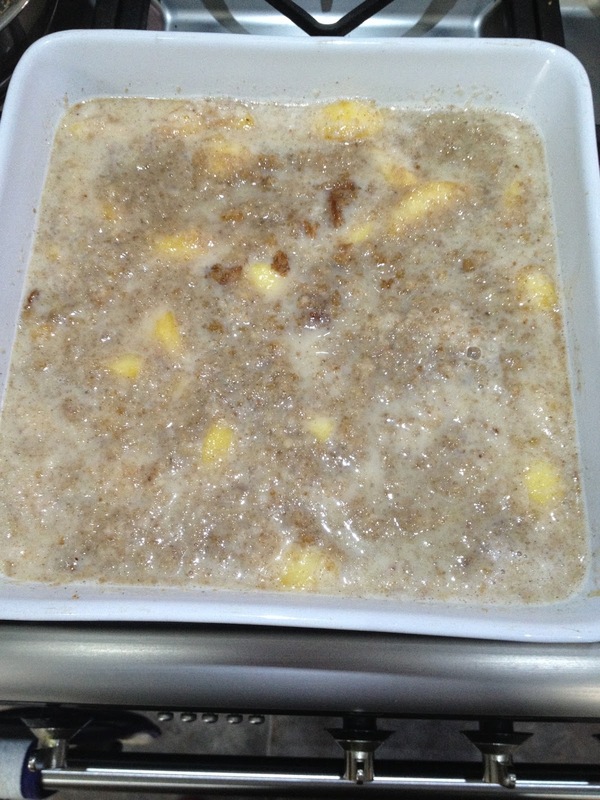 Once the milk is hot, slowly pour into the egg mixture, whisking all the time, to make a thin custard. Add the breadcrumbs to the mix and set aside to steep. 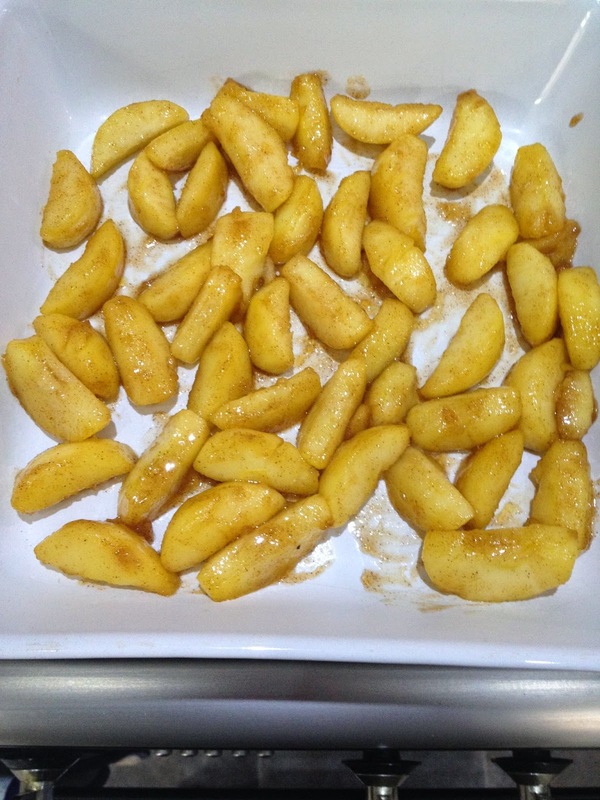 Heat the butter in a pan and add the apple wedges and remaining sugar. Continue cooking until the apples are glazed. And bake in a hot oven for 30 mins until it’s set but still slightly wobbly in the middle. Serve hot, warm or cold and with or without a bug fat dollop of jam. Lovely and comforting. 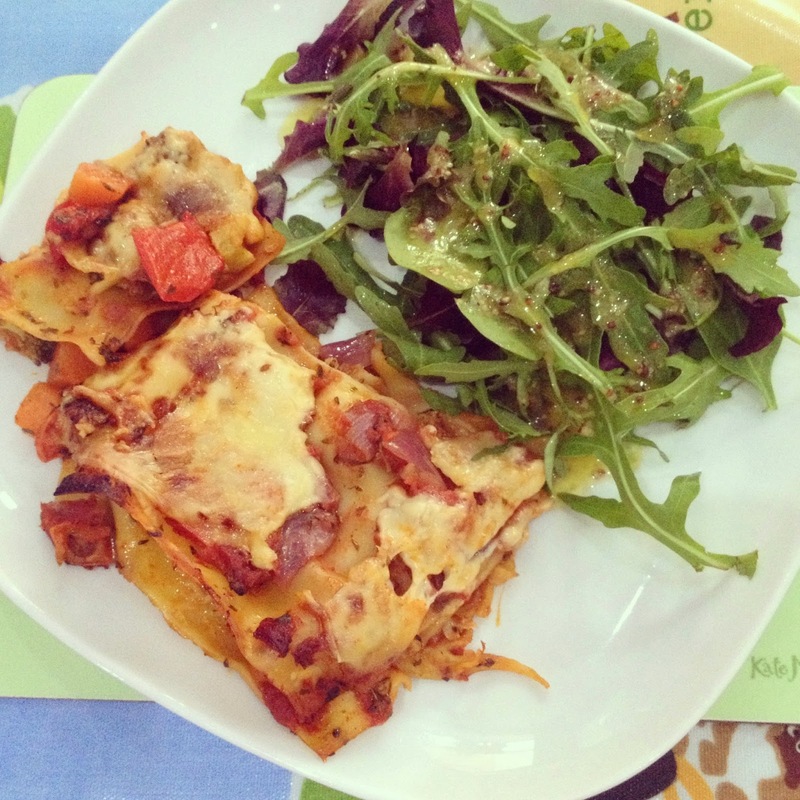 So called because I needed to use up the veg box… I’ve been craving a nice veggie lasagne for a while now and this was a total success. My new lasagne dish triumphs again (I never used to be able to make a decent lasagne!). You can use whatever veggies you want in this, but I like carrots and broccoli in mine. Begin by making the tomato sauce. Heat the oil in a large pan and fry the onion until soft. Add the garlic and heat through. Add the tomatoes and all the seasoning ingredients along with the red wine. Bring to the boil and then reduce to a simmer until slightly thickened. You want a tasty sauce but which is wet enough to cook the pasta whilst in the oven so adjust with some water if you need to. Layer up the lasagne by placing sheets in the bottom of a dish, covering with 1/3 of the sauce and then topping with some chopped mozzarella. Continue with the next two layers, finishing with sauce over the top. Cover with the sliced cheese and the remaining mozzarella. Bake in a hot oven for 40-50mins until the pasta is cooked and the cheese is melted and yummy. Serve with a green salad. Yummo.